The European Commission has recommended that the EU begin talks with Serbia and Montenegro on an agreement that could eventually lead to full EU membership. The announcement follows Serbia's handover of 13 war crimes suspects to the Hague War Crimes Tribunal. But former Bosnian Serb leader Radovan Karadzic and his military counterpart Ratko Mladic are still on the run. 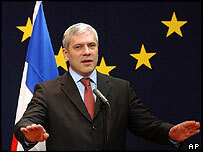 A recent EU study gave the union of Serbia and Montenegro a positive assessment, the commission said. Almost five years after the overthrow of the Yugoslav President Slobodan Milosevic, Serbia and Montenegro has passed its first hurdle on the long road towards possible EU membership. EU Enlargement Commissioner Olli Rehn praised Belgrade's recent record of co-operation with the UN War Crimes Tribunal in The Hague. But Mr Rehn made it clear that EU accession negotiations would not begin in earnest until Serbia and Montenegro had completely fulfilled its obligations to the tribunal. Neighbouring Croatia's accession process was recently stalled by its failure to arrest a fugitive general, Ante Gotovina.